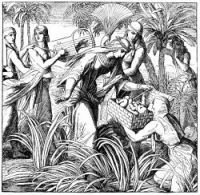 Despite the severe labor exacted on the Hebrews, they continued to increase in numbers, so that Pharaoh became ever more fearful of them. He commanded nurses who attended at childbirth to smother each new born male child in order to end the Israelite race forever. But the nursing women made every excuse possible to avoid the awful wholesale murder commanded of them. Then Pharaoh gave orders to all his troops, his subjects, and to the Hebrews themselves, that they must throw every male child born among the Hebrews into the Nile river. It was during this time of persecution that the Baby Moses was born. His parents kept Moses hidden in their house for three months. 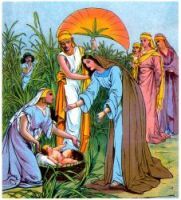 As the baby Moses grew, it became impssible to conceal him in the house, and his mother, Jochebed, decided in desperation to place him in a basket made of rushes and hide him beside the Nile. 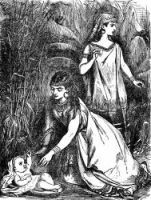 She hoped that the finder of the babe would not realize he was a Hebrew and adopt him. 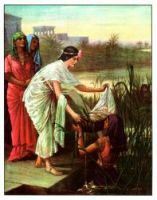 Hidden, Jochebed watched with her daughter Miriam as the Baby Moses was found by the childless, gentle-hearted daughter of Pharaoh. She longed eagerly for a son. The heart of the princess went out to him at once, as she resolved to adopt him as her own. These Baby Moses illustrations are from my collection of antique Bible books. Feel free to use these pictures of Baby Moses in your artwork. Click on the Baby Moses drawings below to see more details about saving a free Baby Moses image or about purchasing the Baby Moses images at a higher resolution.